Note that Notre Dame suffered a devastating fire on April 15, 2019. Reconstruction after the fire may impact visiting hours; contact local authorities for the most up-to-date information. Arguably the most stunning gothic cathedral in the world, Paris’ Notre Dame Cathedral is undoubtedly the most famous. Conceived in the 12th century and completed in the 14th, the now-iconic cathedral was the very heartbeat of medieval Paris. After a period of neglect, it recaptured the popular imagination when 19th-century writer Victor Hugo immortalized it in “The Hunchback of Notre Dame”. Notre Dame’s dramatic towers, spire, stained glass, and statuary are nearly guaranteed to take your breath away. Dig deeper into the history of the fascinating monument by visiting the below-ground archaeological crypt. Climbing the North tower to get a gargoyle’s perspective of Paris is a must, too. The cathedral is centrally located on the Ile de la Cité, the area of Paris that divides the city's right and left banks. The Ile de la Cite is surrounded by the Seine River. 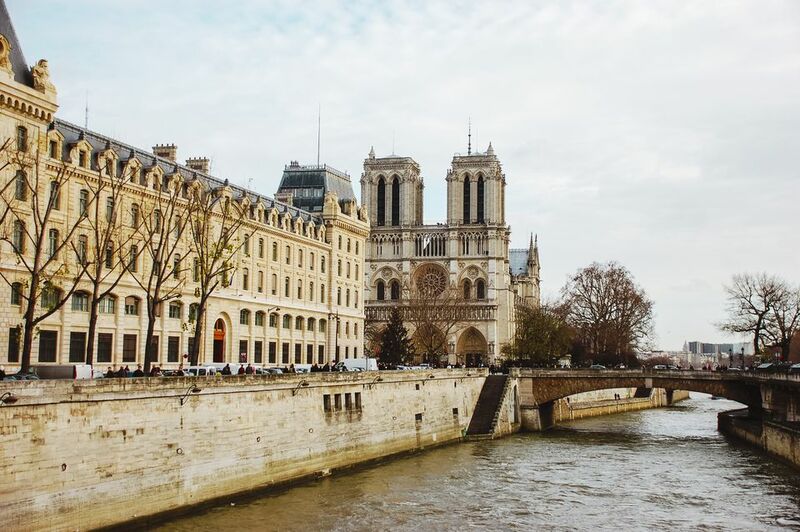 Nearby attractions include the World War II Deportation Memorial, The Sainte-Chapelle chapel, The Latin Quarter, The Marais Neighborhood and Paris boat tours. It's generally recommended to visit Notre Dame in low season (generally October-March): you'll have a better chance of avoiding massive crowds and long lines. In addition, weekday mornings and evenings are generally much quieter than afternoons and weekends. Remember, though, that evening visits to the cathedral will not be optimal for viewing Notre Dame's beautiful stained glass. Finally, visiting at sunset will afford awe-inspiring views of the cathedral's stained glass, notably, the three rose windows. Free guided tours of the cathedral's exterior and main hall are available in English upon request. Call the information desk for more details: +33(0) 142 345 610. Tours of the cathedral towers begin at the foot of the North Tower and involve climbing a total of 402 steps. The observation area for the cathedral's 13-ton bell is in the South Tower. 20 visitors are admitted to the towers every 10 minutes, and the last admission is at 6:45 p.m. The gift shop is located in the cathedral's main hall and sells Notre-Dame-themed jewelry, t-shirts, and other gifts. The Notre Dame Museum is located at 10, rue du Cloitre-Notre-Dame (around the corner from the cathedral) and traces Notre Dame's origins and history. Notre Dame is accessible for visitors with limited mobility. Call the information desk for more details. A Gallo-Roman temple dedicated to Jupiter and two early medieval churches once stood on Notre Dame's foundations. Construction of the cathedral began in 1163. Hundreds of laborers and artisans toiled for nearly 200 years to complete the masterpiece of early gothic architecture. Notre Dame was pillaged and seriously damaged during the French Revolution of the late 18th-century. 19th-century restorations led by Viollet-le-Duc replicated much of the damaged stain glass, statuary, and the cathedral's distinctive spire. During the French Revolution, Notre Dame was temporarily converted to a "Temple of Reason". Notre Dame is full of eye-catching, sumptuous details, but even more are subtle and go unnoticed. Interested in digging deeper into the history of this remarkable site? Also, think about visiting the archaeological crypt at Notre Dame for a fascinating glimpse into the city's Gallo-Roman foundations and its subsequent developments.